Cort Earth Acoustic Guitar in great condition, showing only minor signs of previous use. This acoustic includes a bag. 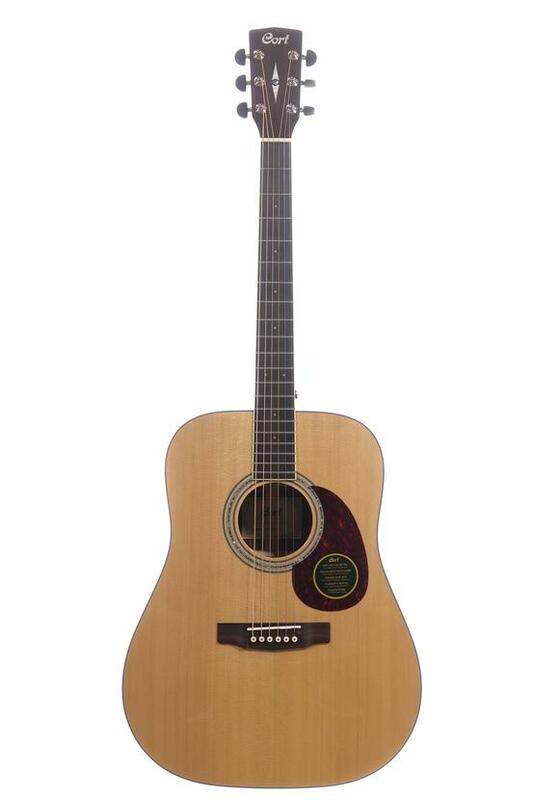 The Cort Earth 100MD Acoustic Guitar features a Solid Sitka Spruce Top that provides and ideal balance between strength and flexibility, hence it is a popular wood material for acoustic guitar tops. Due to its versatile sonic character, makes it idela for a variety of musical genres and playing styles. As Cort's tribute to the great vintage acoustic guitars, the Earth Series showcase the look,sound, feel and playability of an uncompromised, excellent and fine instrument. It is ideal for both flatpicking and fingerstyle players. It has a Madagascar Rosewood Back & Sides. Although its very similar in look and sonic character as the Brazilian Rosewood, the Madagascar rosewood has a reddish grains making it stand out from all other rosewood species. The Madagascar features a more high-end presence and sparkle for a more lively and immediate tactile response. Made of Genuine Bone Nut and Saddle crafted out of a Water Buffalo's bone for a more natural and transparent transfer of string vibrational energy into the guitar's body and neck. Greater sustain with greater string angle thanks to its exclusive scooped surface bridge from Cort. Reducing tension on the string across the neck for less finger fatigue and improved playability. Sonically enhanced UV Finish for a strong and scratch resistant while being lightweight to improve the natural acoustic resonance of the body for a full-bodied and rich tone.